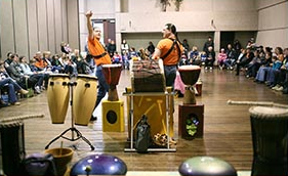 Tribal Thunder brings together Music, Geography, History, Science, Health, and... PERSONAL EMPOWERMENT - All Into ONE incredibly unique and interactive show. We pack A LOT of information into a short period of time, in a lasting way and include a vast amount of curriculum doing so. We are also a resource for teachers and schools should they wish to continue with some of what we share with their students. Typically we bring approximately 50-60 students together per show, and do multiple shows in a day. It is a performance for all age groups. We are well known among Ontario school boards for over 15 years, with constant requests to return to the schools we visit. A printable pamphlet to share at your school is available here: Click here to view/download our pamphlet. As of 2015 the price per student is $6.50+tax and travel. We bring it all to your school, so you get to save money on buses, and no volunteers are needed! What makes it so unique and interactive? 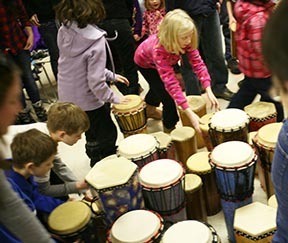 Well a plethora of hand drums for one, we hand out one to each student (and teacher) and have EVERYONE playing in rhythm together within the first 5min, even if they have never touched a drum before! We bring in rare and diverse instruments from around the world explaining parts of the culture, history and geography from which they originated. More than just musical instruments, we have hands on demonstrations for students to actually SEE the science of sound at work. We also offer the students activities they can try at home or in the classroom. Each student also experiences the difference between HEARING and LISTENING, and the power of their own voice (words and actions). There is much more included in the program, all with tremendous benefits too (i.e. increased focusing abilities, increased self-awareness, increased community awareness and understanding, etc). With over eight hundred pounds of equipment, Tribal Thunder will demonstrate the Science of Sound and Vibration, world history, geography, co-operation and respect, through an engaging interaction, using the unifying force of humanity. 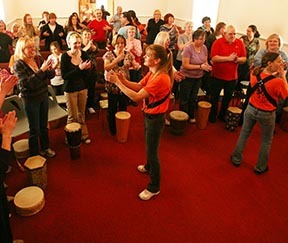 Each participant receives his/her own drum to play and Tribal Thunder facilitates teaching technique, beat and rhythm. At various points Tribal Thunder demonstrates and explains an anti-bullying message as well as the efficiency of co-operation and the responsible and respectful use of one's own personal power. This messaging is important, as children are the life blood and the future of any great nation. Instruments from various cultures - with their geography and a brief history. 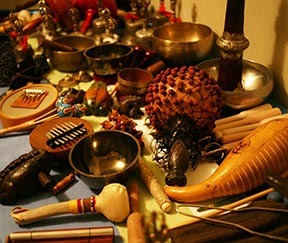 Musical instruments from the woodwind, string and percussion families. Traditional native instruments from various aboriginal cultures. Tibetan Singing Bowls, Bells, and Tingsha, crystal bowls from Silicon Valley, precision ground tuning forks. Various legends, stories and anecdotes shed light on school issues and current events that concern students. The members of Tribal Thunder have over 25 years of experience with applied cognitive science of neuro-acoustics. We are often seen as musicians; however, this is just the surface of our program. We have, over last 11 years drummed with over 230,000 students of various ethnic, cultural, religious, special cognitive and emotional needs. Tribal Thunder is adept at behavior management and utilizes co-operation, not control with the students. For this reason teachers are asked not to interfere with the entrainment process. The methods and technologies transfer easily to a classroom application. This promotes a stronger social structure which enhances mutual respect between students and teachers. School Instrument Packages are also available for purchase. Please inquire. Tribal Thunder Brings The Whole Show Right To You! Tribal Thunder has traveled extensively throughout Ontario over the past 15 years encountering an enthusiastic response and eagerness, providing a service that continues to grow in popularity. Thank you to all that have invited us to your school and passed on your recommendations. We have had exuberant responses from your peers. Contact us with details about your event for custom pricing. 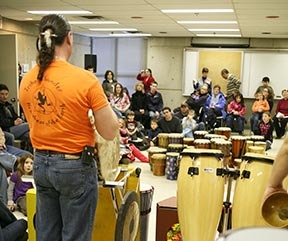 We have School Drum Packages available to keep the rhythm going with your students in the classroom. Please Inquire about our Staff Workshop for Team Building, Stress Reduction and added inspiration!